Wolf spiders are members of the family Lycosidae, from the Ancient Greek word “λύκος” meaning “wolf”. They are robust and agile hunters with excellent eyesight. They live mostly solitary and hunt alone. Some are opportunistic hunters pouncing upon prey as they find it or even chasing it over short distances. Some will wait for passing prey in or near the mouth of a burrow. Wolf spiders resemble Nursery web spiders (family Pisauridae), but wolf spiders carry their egg sacs by attaching them to their spinnerets (Pisauridae carry their egg sacs with their chelicerae and pedipalps). Two of the wolf spider’s eight eyes are large and prominent, which distinguishes them from the Nursery web spiders whose eyes are all of approximately equal size. This can also help distinguish them from grass spiders. There are many genera of wolf spider, ranging in body size (legs not included) from less than 0.4 to 1.38 inches (10 to 35 mm). They have eight eyes arranged in three rows. The bottom row consists of four small eyes, the middle row has two very large eyes (which distinguishes them from the Pisauridae), and the top row has two medium-sized eyes. They depend on their excellent eyesight to hunt. They also possess an acute sense of touch. Flashing a beam of light over the spider will produce eyeshine. The light from the flashlight has been reflected from the spider’s eyes directly back toward its source, producing a “glow” that is easily noticed. This is also especially helpful because the wolf spiders are nocturnal and will be out hunting for food, making it easier to find them. Wolf spiders possess the third best eyesight of all spider species, bested only by jumping spiders of the order Salticidae (who can distinguish colors) as well as the huntsman spiders. Wolf spiders are unique in the way that they carry their eggs. The egg sac, a round silken globe, is attached to the spinnerets at the end of the abdomen, allowing the spider to carry her unborn young with her. The abdomen must be held in a raised position to keep the egg case from dragging on the ground. However, despite this handicap, they are still capable of hunting. Another aspect unique to wolf spiders is their method of infant care. Immediately after the spiderlings emerge from their protective silken case, they clamber up their mother’s legs and crowd onto her abdomen. Because they depend on camouflage for protection, they do not have the flashy appearance of some other kinds of spiders. In general their coloration is appropriate to their favorite habitat. Hogna is the genus with the largest of the wolf spiders. Among the Hogna species in the U.S., the nearly solid dark brown H. carolinensis (Carolina wolf spider) is the largest, with a body that can be more than one inch long. It is sometimes confused with H. helluo, which is somewhat smaller and different in coloration. The underside of H. carolinensis is solid black, but the underside of H. helluo is variegated and has reds, oranges, and yellows with shades of black. Some members of the Lycosidae, such as H. carolinensis, make deep tubular burrows in which they lurk much of the time. Others, such as H. helluo, seek shelter under rocks and other shelters as nature may provide. They may wander from place to place, and are therefore more likely to be the ones attracted into human habitation when the weather starts to turn colder in autumn. 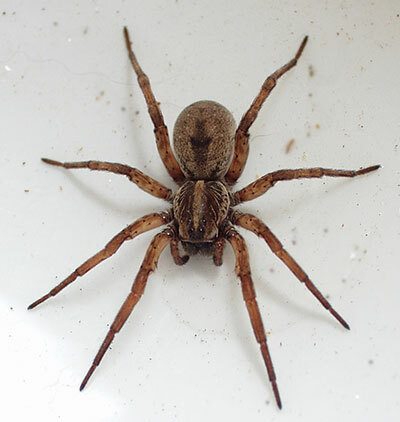 There are many smaller genera of wolf spiders such as those found in the United Kingdom. They live in pastures and fields and feed on smaller prey, playing an important role in natural population control that keeps insect numbers in the wolf spiders’ vicinity within acceptable levels.